Operation Ghost puts players in the shoes of highly trained special force agents. They must use precision shooting and quick reactions to complete the mission whilst using some of the brand new tools at their disposal! 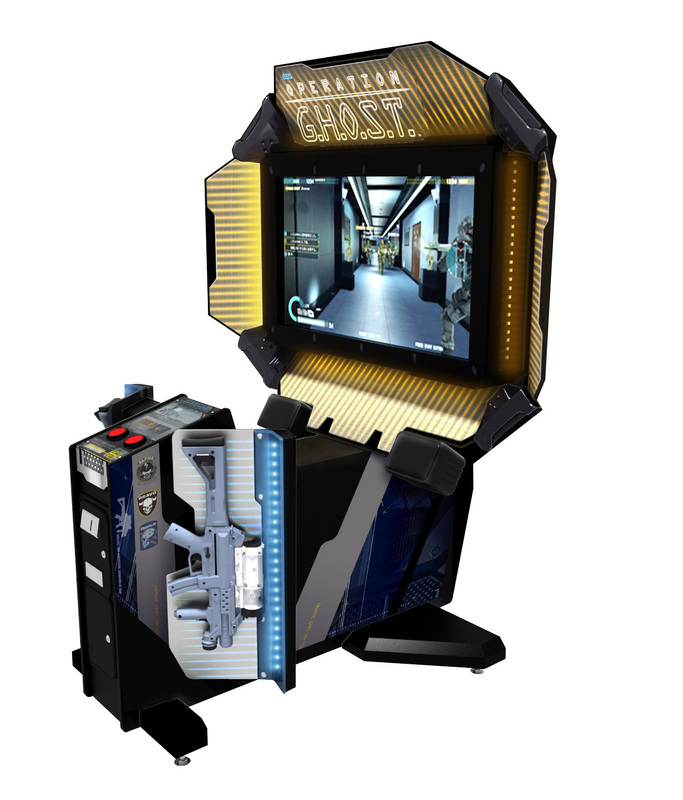 As well as new weapons, gadgets and equipment, Operation Ghost features a multi-coloured LED monitor surround. This feature enables; extended off-screen targeting, enemy approach direction indication and provides a game play experience that has never been seen before. This follows in the footsteps of other recent Sega light-gun arcade games such as Golden Gun and Let’s Go Island although it’s style is more along the lines of Rambo. Operation GHOST has five player selectable stages as well as challenge levels like the sniper round integrated into the game as well. So far it’s only been shown in a 42″ format, whether they will also release a 32″ version remains to be seen. The page doesn’t describe how that scope on the top is used, if that’s just a sensor(seems unlikely given the bulk of the scope) or if it is something that the player can look through ala Silent Scope Sam in the comments says that the scope is actually a speaker where voice commands come from the game. So that means it’s hearkening back to Primeval Hunt, albeit a little different as the speaker on that was on the back of the gun and made the balance strange. The LED net around the monitor is an interesting idea, one I would certainly like to see in action. Stay tuned for pics of the game at the AAMA Gala, we expect to see those very soon – if it’s soon enough I’ll add them to this post. The scope on the top of the gun is a speaker. You get the game audio/voice commands from that speaker. Thanks Sam! I assume you had a chance to see this at AAMA? Anything else noteworthy there? I got a chance to play it a little. The LEDs are positioned around the monitor pointing outward. Stainless steel panels surround the monitor and theny reflect the LED lights to make it look like lines. It looks pretty cool when you’re standing there looking at the cabinet since the LEDs react differently to what’s going on in the game. But when you’re playing the game, I didn’t notice the lights at all. It’s still a proto so the audio syncing was a little off and the voice commands were playing at 1.5x the normal speed for some reason.